Over the past half century, our understanding and awareness of spirituality has changed in nature, as have the issues facing activists. Spirituality is rising up the agenda for activists because it offers distinct, tried and tested approaches to deep questions such as Where did it all go wrong? What does it mean to be human? What is the place of leadership? What is the nature of power? This book starts from scratch, defining spirituality for a generation sometimes dazzled by the claims of materialism. Where others attempt to distinguish science and religion, Spiritual Activism instead contrasts spirituality and materialism. 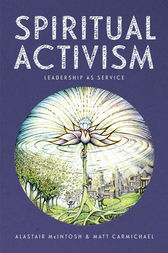 The text is peppered with tales from the authors’ activist experience and includes case studies of inspirational spiritual activists that demonstrate the transformative power of spiritual principles in action.